She is bouncing back - able to walk a little further and do a little more almost every day. It will take some time, one step at a time. My race plans for this spring were altered a bit. I was originally planning to run the USA 25K Championship, but due to my hamstring that didn't happen. I decided to back off the intensity for a while and get back to base training. I'm still going to run the USA Half-Marathon Championships in Duluth next month, but that will end up being more of a "see where I'm at" race instead of a peak performance. I was lucky enough to spend a few days in Boston earlier this week, hanging out with the team at Saucony and previewing the new shoes/apparel for 2014. The product line is amazing. The company is full of so many passionate, innovative, and smart people, and what you are going to see from them in the upcoming months/year is going to convert you to Saucony if you haven't already! While I was in Boston I did a long run on the marathon course, running the Newton hills section of the route twice. It really ignited my fire to get back there in 2014. 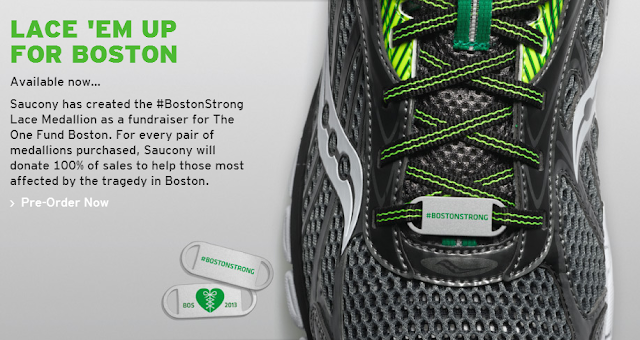 And on that note, Saucony is still selling their #BostonStrong lace medallions - all of the sales go to the One Fund Boston. I ordered a couple pairs... its a great fundraiser. I thought your last post was awesome but that's probably the nurse/anatomy geek in me. Hope that you both heal up quickly!